Thanks to support from Kohl’s Corporation, the Fashion Merchandising program has acquired two exciting new software programs that will allow students to better prepare for their careers. SmartDraw is a tool for creating retail floor plans and plans for merchandise displays. Students will use this software in FSMD 272, Merchandising Promotion, to create plans for store floor layout and store fronts with window displays. 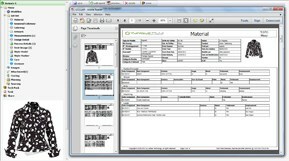 Gerber YuniquePLM is a product life cycle management software for the fashion industry. Students will use the software in FSMD 355, Apparel Product Analysis to prepare product specification sheets. Students will also use the technology in FSMD 456, Apparel Product Development, in the creation of full specification packs, including mood boards, color palettes, technical drawings, graded measurements, costing sheets for labor and materials, care label pages, and hang tag specifications.